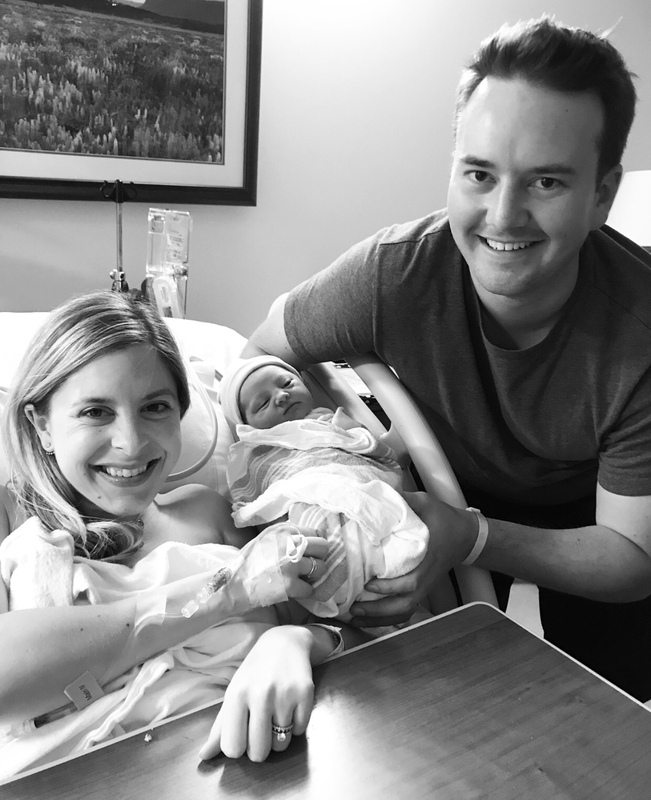 On Friday, September 14 at 10:09 p.m., we welcomed Ainsley Rose into our lives, and our hearts grew even more than we ever could’ve imagined. She was 5 lbs, 15 oz and 19 inches long. 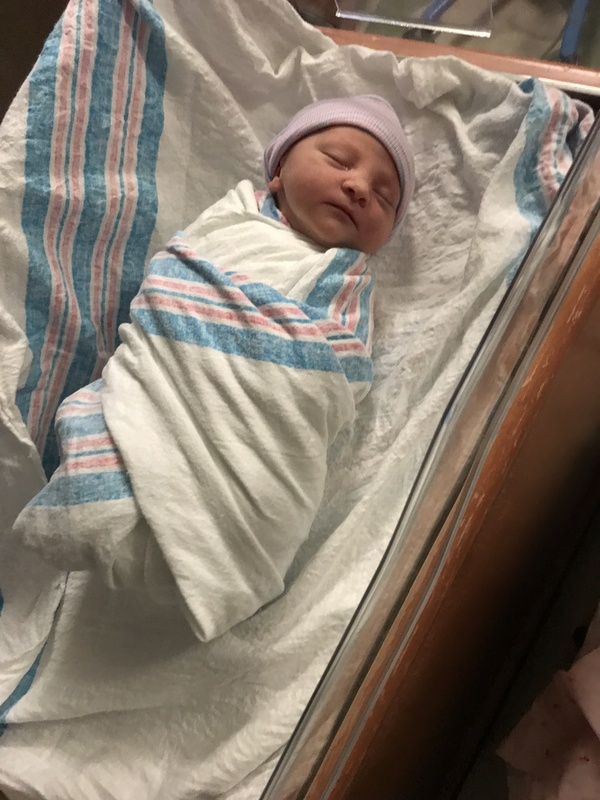 Our little love surprised us (to say the least) with an early arrival. Bill had just gotten home from California the night before and both my dad and in-laws were out of town. Everyone was getting his or her last trips in before our due date on October 2. 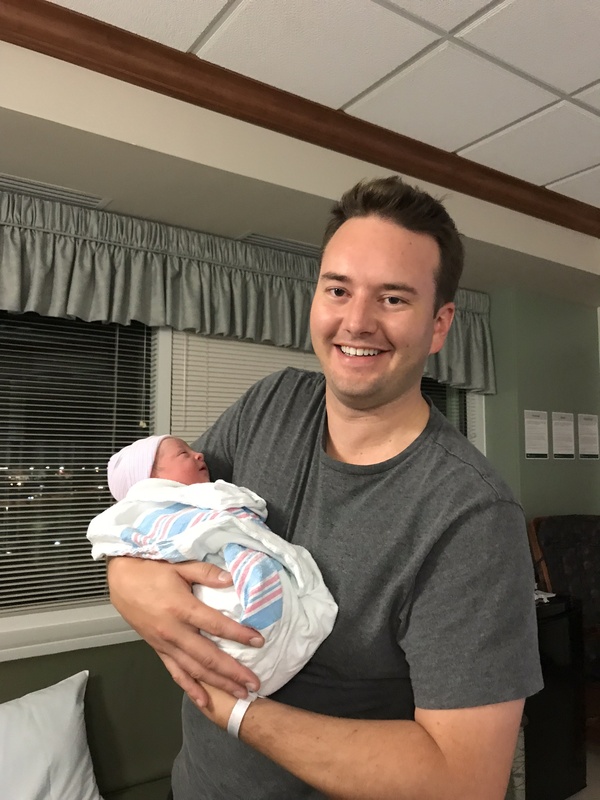 I guess I could take a quick step back as I never really posted an intro to my pregnancy on the blog. I found out I was pregnant just over a month after my mom passed away. Talk about something you really wish you could’ve told her. However, I truly believe she and my brother were watching over us the entire time as I was extremely fortunate that my pregnancy, labor and first few weeks at home were and have honestly been really great. My friends and family all agreed that we needed something to go well so we’re counting our blessings each and every day. 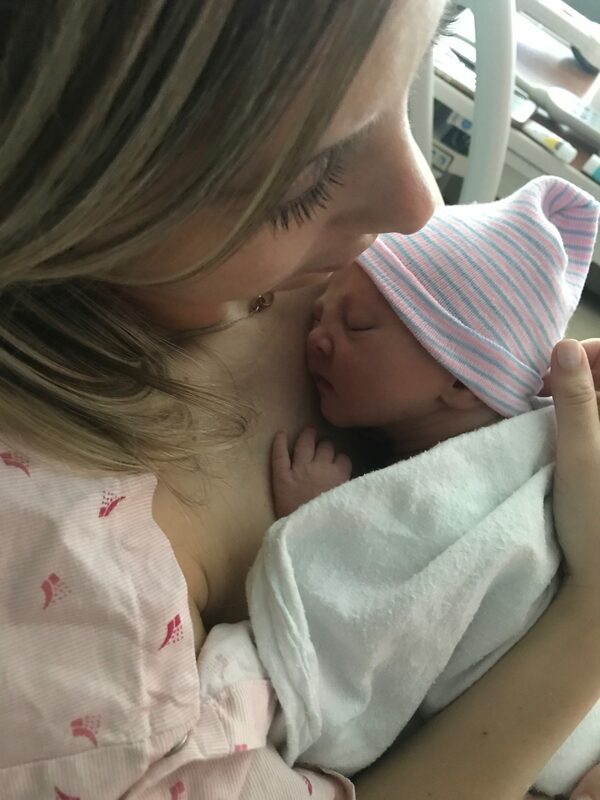 Okay, back to Ainsley’s arrival (Since I don’t have a journal this is my way of remembering the day, and I completely understand if this isn’t very interesting to you so either feel free to skip over this post or just look at the photos. Admittedly, I now find birth stories much more interesting to read after giving birth…go figure). Things started to get interesting very early Wednesday morning. At around 1 a.m. I woke up with a lot of pressure and was feeling nauseous. I hadn’t been nauseous throughout my entire pregnancy (like I said earlier, thank you mom and Kevin). My girlfriend had just given birth a week prior (hey, Maureen! ), and I remembered her telling me she got more nauseous as the due date approached. I thought these symptoms were both relatively normal for being 37 weeks; however, I really didn’t feel like myself. I called the nurses line around 6:30 a.m., and they recommended taking it easy so I worked from home (i.e. in my bed all day). I actually got so much done which was extremely needed as I was getting more and more nervous about wrapping up projects prior to my maternity leave. Bill was still in California for work, and I went into the office. It’s worth noting that he got the trip approved by me three months prior, and at the time, it didn’t seem like a big deal. Plus I thought the first born usually arrives late, but when he left on Monday morning, I had a feeling that she would be coming early and just hoped it wouldn’t be while he was gone. While I was at work, I started to have the pressure again and contractions around 1 p.m. I thought they were Braxton Hicks contractions since I hadn’t had them my entire pregnancy so 37 weeks seemed like the right time to get them. I was timing them just in case and once again had this feeling baby girl was making an early entrance. I met with one of my colleagues to go through as many projects as I could and then packed up a bit early in case the contractions started to get closer together. I desperately wanted to see Bill so I ended up driving straight to the airport. When I picked him up, I was having contractions about 10 minutes apart but we decided that we wanted to go out to dinner. We hadn’t really done a date night throughout the pregnancy as we prefer to pick up take out and watch a movie on the couch, but it worked out perfectly. We went to Onesto where we took some of our engagement photos. It was meant to be because we found a parking spot right outside of the restaurant which never happens in the Third Ward and ran into some of my parents’ best friends. When we got home, I changed into my pajamas immediately and crawled into bed. I was still having contractions, and my Notes app was completely filled with timestamps and duration times. We called the nurses line around 11:30 p.m. but the nurse didn’t seem too concerned, and I told her we had an appointment at 10:15 a.m. the next morning with my doctor so we were playing the waiting game until then. That night, I didn’t get much sleep although I felt pretty well rested in the morning. The contractions ranged from 5-10 minutes apart throughout the night and lasted 30-60 seconds. Since I couldn’t get a good stretch of sleep in, I got up and started to get ready for the day. I took a long shower (made sure to shave my legs of course), finished packing my bag and Ainsley’s for the hospital and painted my nails. I also finished the laundry, cleaned a bit and prepped some returns. I had Bill stop at UPS on our way to the doctor’s office to check that off the list. Here was the photo I posted on Instagram Stories before we left the house but failed to mention that I was having contractions #surprise. Last Bump Photo at 9:12 a.m. When we arrived, our nurse called us back and asked how I was doing. I gave her the update, and she said that those sound like early labor contractions, not Braxton Hicks contractions (how many times can I type contractions??). Our doctor came in and said the same thing. In Bill’s mind this meant we were having the baby within a week. Well when my doctor checked, I was 2-3 cm dilated, and she told us we’d likely be going into the hospital that afternoon. I believe Bill’s exact words were, “Well this just got real.” Yes, yes it did. She told us to go home since I would be more comfortable there and because our drive to the hospital wasn’t very far. Now is probably a good time to note that we were supposed to have our Labor & Delivery class the next day, and we may not have done all of the reading we intended to. When we got home, Bill laid down a bunch of towels below and over our sheets just in case my water broke. We were not about to ruin our new mattress 😉 He was trying to catch up on work emails, and while I kept trying to work on my computer, my contractions were pretty distracting. I did manage to open the book we got at our very first appointment, and sure enough, when I read the section on Early Labor, everything made a lot of sense. Once my contractions hit four minutes apart, I called my doctor. I didn’t want to wait too long and have things start to progress too quickly while at home. They gave me the green light to head to the hospital so we packed up the car (that didn’t have the car seat installed yet) and made our way there. I quickly grabbed a granola bar and Wheat Thins for the drive. I wasn’t too hungry because I was still nauseous but all of my girlfriends told me to eat before we arrived, and I’m glad I did. We got to the hospital at 1 p.m. on the dot and headed upstairs after signing some paperwork. It felt odd arriving so casually. I had been worried about my water breaking at work and rushing home (a 45 minute drive) that this seemed a little too good to be true. 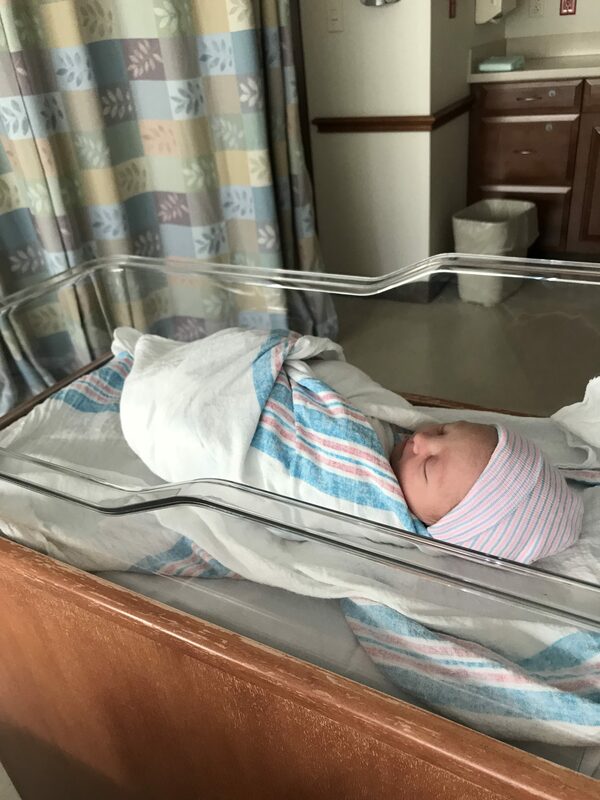 Once we were situated in the room, they checked me again to see if I was further dilated, and honestly, I have to say that some of those checks hurt more than some of the contractions. She was so low that it made it more difficult. I was still making progress but it was a waiting game at that point. I sent out work emails as quickly as possible for about three hours until the contractions got much more intense. The doctor came in and ended up breaking my water to help move things along. This is where things get a little blurry (not because of the pain but because I already have mom brain, and I can’t remember the exact timing and order of things). All in all, it was a pretty textbook labor. I find parts more amusing because of how clueless we were. In retrospect, I probably should’ve gotten the epidural earlier, but I had no idea how bad the contractions would get, and I had felt like they were relatively manageable…until they weren’t. By the time I got the epidural, I was shaking I was so cold and working through some painful contractions. They gave me a pillow to squeeze while I was sitting up on the bed, and I’m surprised I didn’t rip it apart. But once the epidural kicked in, I was feeling much better. I fortunately still had good control over my legs, which made me feel better about pushing whenever that was actually going to happen. We met our new nurse at shift change around 7 p.m., and we loved her. She walked us through everything and I mean everything. I think this was much more helpful than the Labor & Delivery class would’ve been the following day. Once she finished going through what to expect and all of the logistics and paperwork, she told us to get some rest. At that point, Bill and I were thinking we’d meet our little girl early Saturday morning. Our nurse had me turn on my side to sleep with a peanut medicine ball between my legs and told me to hit the call button if anything changed. She left around 9 p.m., and since we were back to the waiting game, Bill went into the bathroom to change into more comfortable clothes. 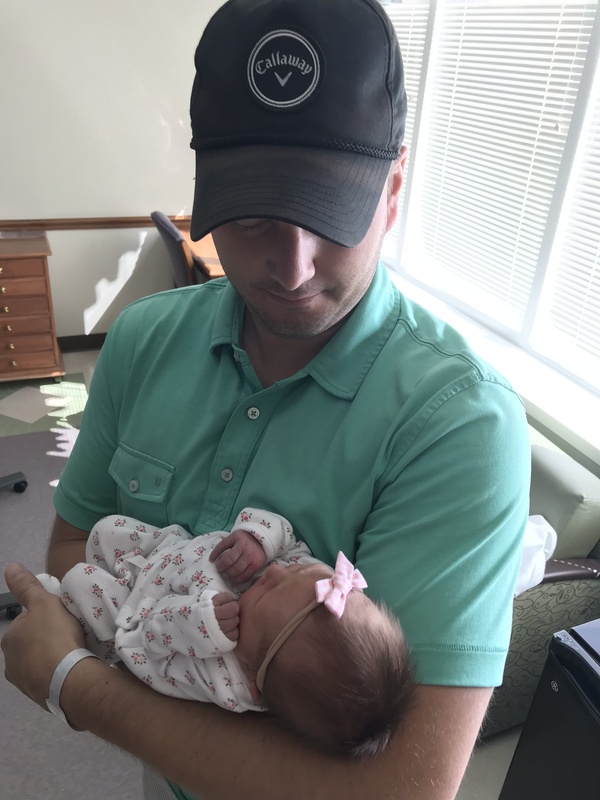 I was so excited to take a nap, but in less than two minutes, the pressure got really intense – it didn’t hurt but it sure felt like she was about to just drop out without me even pushing. I frantically shouted for Bill because I couldn’t reach the call button. The doctor came in and said sure thing this is happening. Not to mention, they could already see her hair without me pushing (definitely didn’t know that was possible). The nurses had everything set up around 9:15 p.m. and we got started pushing. They were incredible and continued to talk me through everything. They might have been surprised how much I didn’t know…like how I had to hold my breath while pushing?? That didn’t seem right, and I ended up needing oxygen in between. Apparently my exercise-induced asthma was still a thing. You could say I hadn’t worked out in awhile. Side note: Bill had the Brewer’s game on before I started pushing, and we never turned it off throughout the labor. While pushing, Mike “Moose” Moustakas hit a home run. Towards the end of my labor, Moose was up again, and Bill said that if he hits another homer, her nickname has to be Moose. I didn’t think that was a very cute nickname and he ended up hitting a double so I ignored it. On Ainsley’s one week birthday (almost to the minute), Moose hit a home run. Ainsley is now our ‘Mini Moose’, and I couldn’t love it more. I’m so glad the game was on in the background. It gave us something to joke and talk about instead of everyone just staring at yours truly in between pushes. I pushed for about 50 minutes. They kept saying just one more round but that stretched to probably three more. It was really crazy to feel how close she was but not being able to get her out. The competitiveness in me kicked in because I didn’t want them to have to say just one more push again. Plus, I was seriously ready to meet her. When she came out, Bill shared, “It’s a girl!”. I was cracking up because there was part of us that thought we were somehow having a boy even though they told us a girl during the ultrasound. No one else laughed when Bill shouted this out. I think they were like well yeah, duh, we knew that…I was grateful he told me right away. Thanks, honey! First Family Photo at 11:50 p.m.
Ainsley was the name one of my aunts and uncles had picked out for a girl, but then they went ahead and had three boys and never used it. When my aunt told me the name in April, I instantly loved it, as did Bill when I told him. We knew we wanted Rose for the middle name after my mom Rosie, and we loved the combination. While we still made a list of other potential names, we kept coming back to Ainsley throughout the pregnancy so we knew it was ‘the one’. I shared this on Instagram, but in case you missed it, right after the delivery, there was a knock at the door, and while I couldn’t see who was dropping something off, I heard the nurses say “Thank you, Rosie.” How’s that for a sign that my mom was with us the entire time? 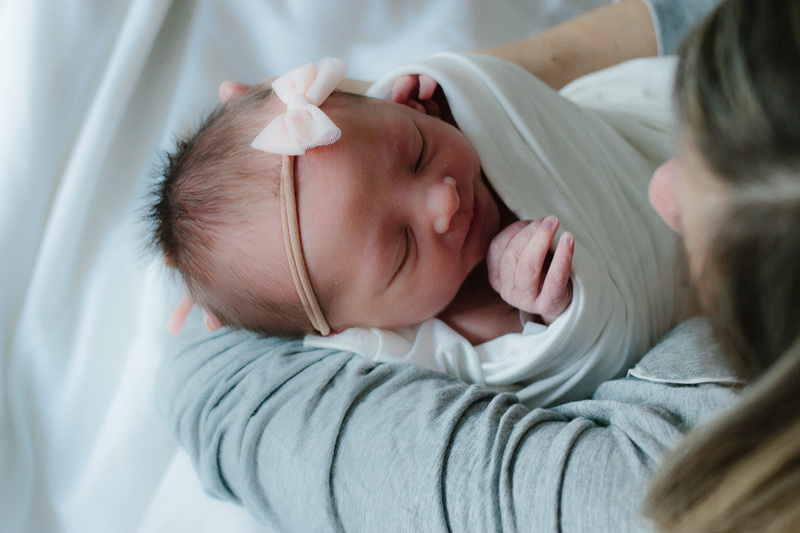 Ainsley is truly our little angel on earth that arrived just when we needed her most. I will also say that Bill was more involved than I initially anticipated but it was really incredible and special. Something we’ll never forget that’s for sure. He was such a proud dad as she got measured and weighed and seeing him holding her for the first time just about melted my heart for like the tenth time since she came into this world. 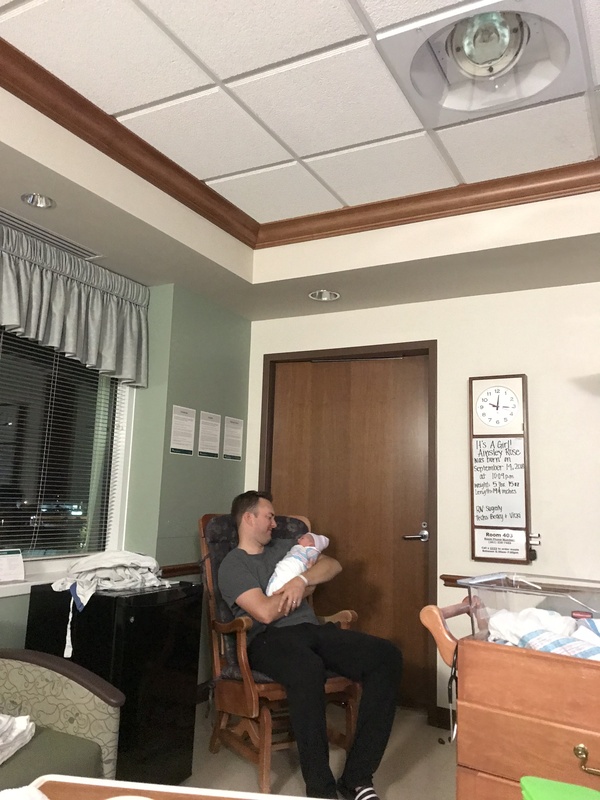 The first skin to skin was amazing, and I’m extremely grateful everything went as planned and that I was able to have this time with her. Every snuggle has been special these last six weeks but nothing will beat that first time together. Once I was done with skin to skin and feeding her, the nurse had a sandwich ready for me in the fridge. She told me it would be the best sandwich of my life, and while I was skeptical of her bold statement, it 100% was. Ladies, I would totally ask your nurse about this just in case he or she is not as proactive as ours was 😉 And thank you to my sister who had dropped off food earlier so Bill had something to eat too. Otherwise he would’ve been out of luck because even though I love him, there was no way I was sharing any of the food on my plate. 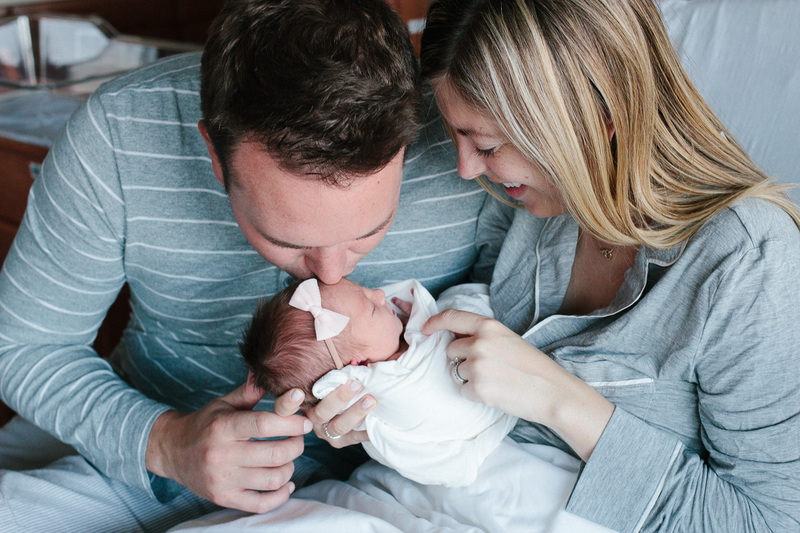 From that point on, we were on cloud nine, except for when we had to swaddle her. What in the world? Those blankets are tough and the nurses make it look so easy. It was not easy for us, and we had to keep asking them to come back in to help . 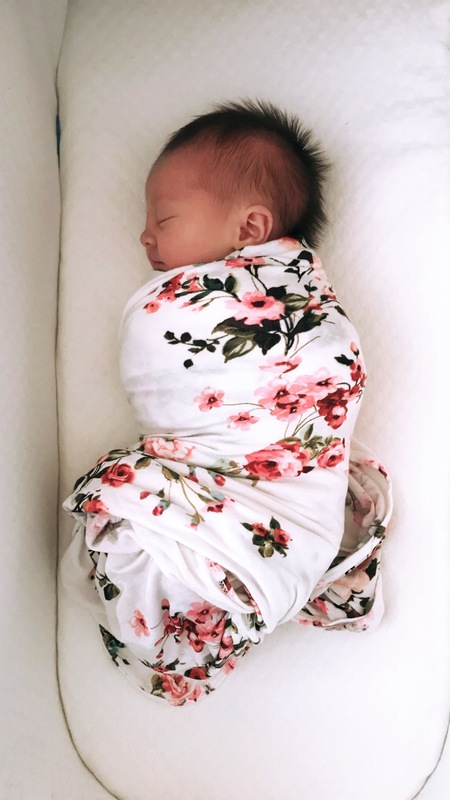 I brought the Lou Lou & Company swaddle and the stretchy fabric made it much easier for us. I still never really mastered it and relied on the Halo swaddle with a zipper and Velcro when we got home. We were discharged on Sunday. Everyone was trying to leave before the Packers game so the floor was pretty busy and we definitely needed help with the car seat. Bill thankfully installed the base on Saturday, but I had never touched it. 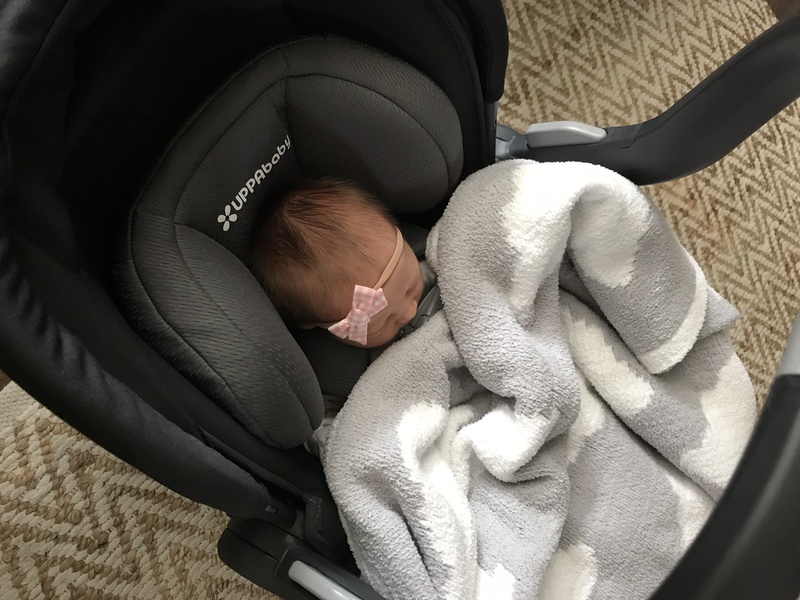 He stayed on car seat duty for the first week of her life. The first time I took her to my dad’s house for family night dinner, I couldn’t get her out of the car because I was using the wrong buttons. I gave in and had to call Bill. Everyone says time goes by so quickly and there’s no exception here. I feel like the nurses were just placing her on my chest at the hospital and now somehow it’s been just under six weeks. We’ve been laughing our way through the spit ups and the diaper blowouts and loving our family walks and story time. 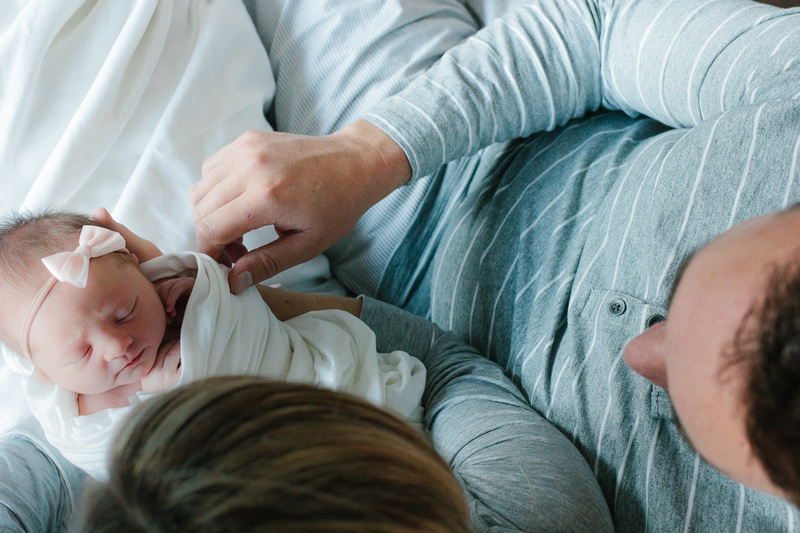 Parenthood is the most rewarding and humbling experience, and we’re forever grateful that Ainsley made us a mom and dad. I loved reading this story! She is so incredibly beautiful. You and Bill are the luckiest. I can’t wait to meet her someday… so happy for the three of you! Love! Such a great labor story!! You are a fiercely awesome mama, I can just tell!